Of all the bags that we’ve seen translated from women’s signature styles into men’s briefs, duffels and weekenders, the Alexander McQueen Heroine Satchel wasn’t one that I expected to ever find on that list. It seemed too curvy, too detailed to make the jump, the closure too cumbersome for the kinds of functional requirements men usually make of their bags. (Believe me, we’re willing to put up with a lot more than the dudes are.) 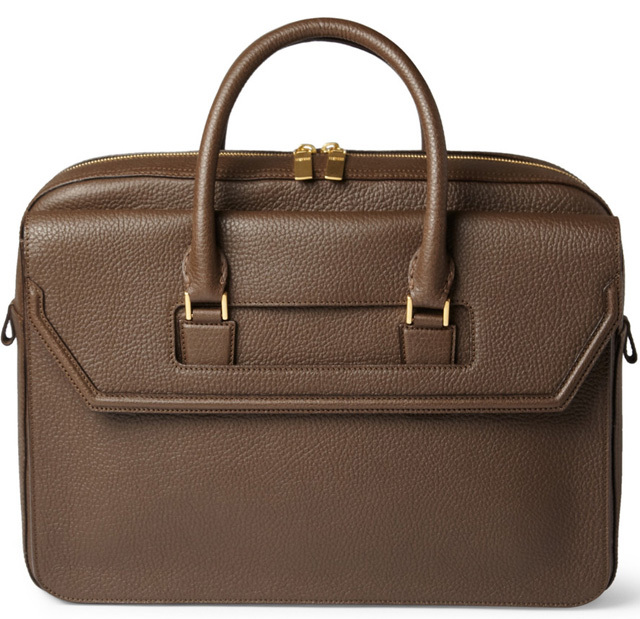 And yet, here’s the Alexander McQueen Full-Grain Leather Holdall, proving me wrong. For this bag, the team at McQueen smoothed out the Heroine’s signature curves into an angular trim finishes the front flap. That’s not the only notable modification to the flap closure, though; instead of using it as a cover for the top of the bag, the dudes get theirs moved to the front pocket in favor of a zip-top closure that makes accessing your belongings much simpler. After all, who wants to be forced to take your arm out of a bag’s straps and sit it down in front of you in order to be able to access literally anything inside of it? This men’s interpretation preserves the signature handle-threaded flap but makes the bag a thousand times more functional. Looking at it now, I’d never guess that it’s derived from a women’s style if I didn’t already know. Buy through Mr. Porter for $1,995.